Monrovia – President George Manneh Weah broke ranks with his own party Monday, distancing himself from laying the blame of the current economic woes on the doorsteps of his predecessor, Ellen Johnson-Sirleaf, and her Unity Party government. Less than a week after the party’s chairman Mulbah Morlue declared that former President Sirleaf’s bad economic policies were responsible for the hyperinflation being experienced in the country; and just days after the Speaker of the House Bhofal Chambers went a step further in urging the President to take “hard decisions” in going after those in the previous government; President Weah kicked off his much-anticipated address with a clear message that now is not the time to shift blame. “Today, five months later, it is not for us to complain about the bleak situation we inherited; or to cast blame upon previous administrations,” the President asserted. For many Liberians, Monday’s speech was a yearning for answers. The skyrocketing exchange rate is on the verge of surpassing the 171st birth anniversary of Africa’s oldest republic, a number of businesses are pondering packing up and leaving and many others are giving employees the pink slips because they can no longer afford to keep them on payroll. For President Weah, it was about finding answers and assuring an antsy nation that his administration though still young is doing all it can to find a remedy to the ongoing economic malaise. “Ours is a duty and responsibility to find new and sustainable solutions to these age-old problems that have stubbornly defied solution in the past. We were very aware of these systemic problems when we decided to run for the high office of President of Liberia, and so we are not surprised. And we are fully aware that we were elected with the expectation that we will solve these challenges. This is a task that we are now embarked upon with strong determination, focus, and commitment. The President said the development strategy and implementation plan will serve as a road-map for the urgent and important next-steps to be taken in giving direction to our economic recovery and will consist of short-term interventions, medium-term reforms, and long-term restructuring of the Liberian economy. Part of the President’s response to alleviating the problems confronting the government he inherited was yet another promise to empower Liberian-owned businesses. “We intend to encourage and empower Liberian businessmen and Liberian-owned businesses to lead the transformation of the Liberian economy. We will enable them to become more competitive, by providing affirmative policies and support, including ready access to finance and expertise. The aim and intention of this approach is to encourage import substitution and manufacturing for export, as well as sustainable wealth and job creation. But this is a medium-to-long term solution. To lessen the immediate negative impact on our people, it will be an urgent imperative to devise and implement short-term fixes to the current problem. The President had made a similar promise during his inaugural address in January when he declared that Liberian owned businesses will not be marginalized but given equal opportunities with foreign businesses or investors during his administration. “As we open our doors to all foreign direct investments, we will not permit Liberian-owned businesses to be marginalized. We cannot remain spectators in our own economy,” President Weah said during his inauguration. For many Liberian businesses, however, the government has so far failed to live up to its end of the bargain. The President has had a few meetings with foreign-owned businesses and failed to invite any locally-owned businesses when he met with Lebanese and Indian business owners last week. One of those owners, Mr. Amin Modad, CEO of Bella Cassa Hotel and Atlantic Foods believes the inclusion of diverse ideas is necessary. “The best approach at this time is to organize an intense stakeholders forum to properly diagnose the economic conditions, conduct an impact assessment to understand which sectors are most vulnerable or worst affected, and identify realistic actions to move the country forward,” the businessman said in an Op-ed Monday. Perhaps the highlight of the President’s speech was the pronouncement that his administration plans to announce a series of monetary and fiscal measures in a bid to reverse the decline in the value of the Liberian Dollar. One of those measures includes the immediate infusion by the Central Bank of Twenty-Five Million United States Dollars into the economy to mop up the excess liquidity of Liberian dollars. The President is also mandating the CBL to provide more effective supervision and regulation of money-changers or foreign exchange bureau, provide more robust oversight of banks under its supervision and conduct a comprehensive review of regulations on the hoarding of both Liberian dollars and U.S. dollars outside the banking system, and provide incentives and safeguards to encourage the utilization of the banking system, including financial instruments. He added that the prices and demand for exports have been determined and affected by factors beyond the country’s borders, and are therefore beyond its control. “Slumps in demand for the products which utilize our raw materials will always result in externally-generated shocks to our economy. The world as a whole is facing new economic challenges. Of late, trade wars between the major manufacturing countries could also reduce demand and place downward pressure on the prices of our major exports. The President also suggested that the departure of the United Nations Mission in Liberia has also been a factor hurting the economy, stating in regards to investor confidence, that Liberia has moved to a new level of sustainable peace, which has led to the withdrawal of the United Nations Peace Mission in Liberia. However, he explained that the negative impact on real estate, and inflows into the economy of the US Dollars spent by the former Peacekeepers, is significant. Toward this end he said, finding lasting solutions to the present macroeconomic challenges will take some time because nothing less than the structural transformation of the Liberian economy will produce sustainable recovery and growth as he urged Liberians to remain calm and be patient. “The road to this transformation will be long, and sometimes difficult, and so we ask our people for patience. Prior to Monday’s speech, many Liberians appear despondent amid calls for President Weah to address the burning issues of the day. By the end of the little more than twenty minutes speech, many felt the President did not go far enough in restoring confidence in Liberians or resuscitate an economy in decline. For the immediate future, President Weah finds himself trying to avoid the trappings of power while struggling to grapple with the stark realities of what is unfolding before his eyes. 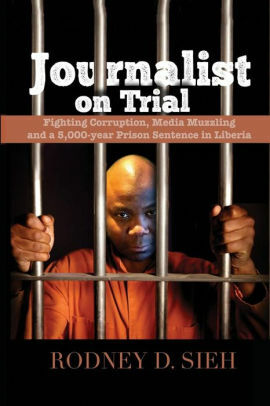 For the immediate future, President George Manneh Weah finds himself trying to avoid the trappings of power while struggling to grapple with the stark realities of what is unfolding before his eyes. Within his own party there appears to be division over how to proceed. Blame the Sirleaf administration? Prosecute those accused of corruption under her watch? Implement the Truth and Reconciliation Commission’s findings? Within his own party, there appears to be divided over how to proceed. Blame the Sirleaf administration? Prosecute those accused of corruption under her watch? Implement the Truth and Reconciliation Commission’s findings? Clamp down harder on corruption or as Speaker Chambers said last week, zero in on making the tough choices and decisions. “We need to take some decisions regardless of the personality, religion, and tribe. We need to safe Liberia; we need to go after people who created this mess. Simple instruction is given to the President by the Legislature: ‘Go and print new banknotes and remove the mutilated notes from circulation.’ Ellen and her officials went and printed money in billions and maintained the old bank notes. “We heard that some of our money was printed in Lebanon; we get information that people bring our legal currency in containers for their personal use. We need to go after people who created this mess,’’ Chambers said. Beneath the realities of a party divided over the politics of the blame lies the fact that many Liberians remain perplexed about the irony versus the political will to proceed. While pressing the President to bring Sirleaf and her alleged corrupt officials to book, President Weah is also facing criticisms of his own due to his reluctance to declare his assets and inclusion of many accused corrupt officials in his government. Mr. Abraham Darius Dillon, head of Political Affairs in the opposition Liberty Party said Thursday that he was annoyed over the President’s call on Liberians to exercise patience. “I am only really concerned and annoyed over your appeal for Liberians to be “patient” during these harsh and very difficult economic times being faced by especially ordinary Liberians. Here are few reasons: Liberians cannot and should NOT be “patient” whilst you are acquiring, constructing your new personal properties as well as reconstructing the old ones. No sir; Liberians cannot and should not be “patient” whilst some of your closest officials are acquiring new personal properties, riding flashy expensive cars, and traveling out of the country at every and any instance at the detriment of needed tax dollars. No! Liberians cannot and should not be “patient” whilst you lead your appointees into refusing, neglecting and failing to declare assets in keeping with the law. No way, Sir! Liberians cannot and should not be “patient” whilst you practically kill integrity in government and promote lack of respect for the rule of law. 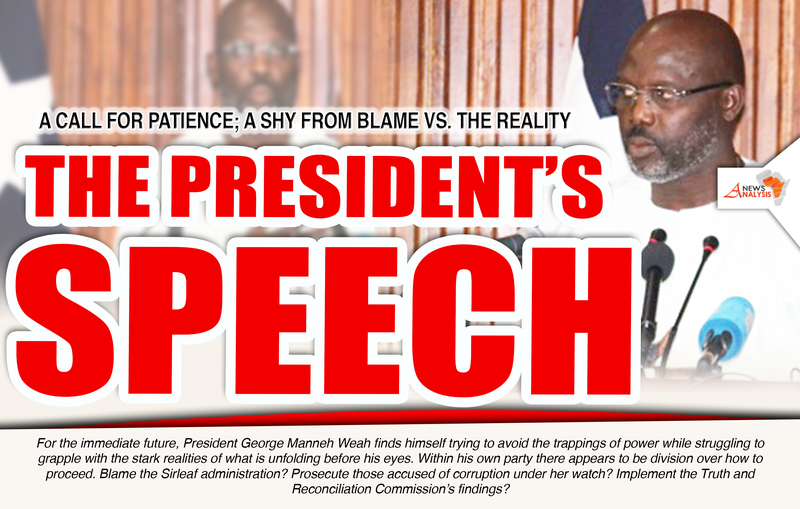 For the foreseeable future, it is unclear how much of an impact President Weah’s speech Monday will have on the dwindling economy. What is clear for many is that several factors in the coming days will be determining the impact made as the country limps toward its 171st independence anniversary – beginning and ending with the ever-increasing exchange rate and the rocketing prices of local goods and commodities on the market.